FBI Agent George Wigan: He does fit the profile perfectly. He's intelligent, but an under-achiever; alienated from his parents; has few friends. Classic case for recruitment by the Soviets. Lyle Watson: Now what does this say about the state of our country, hmm? Lyle Watson: I mean have you gotten any insight as to why a, a bright boy like this would jeopardize the lives of millions? FBI Agent George Wigan: No sir. He says he does this sort of thing for fun. Arthur Cabot: Dammit, John, I want some answers and I want them *now*! Q: How did David manage to connect with such a secure defense system computer like "Joshua", aka the WOPR? Q: What's the video game that David is playing at the arcade when he's late for school? Q: Why was David letting his computer dial so many random numbers in the Sunnyvale area? A rogue young man named David (Matthew Broderick) along with his best friend Jennifer (Ally Sheedy) hack into their high school's computer to change his grade and later on , find a back door into a military central computer in which reality is confused with game-playing, possibly starting World War III . As the United State's Department of Homeland Security is led to believe an American teen hacker playing a terrorist-attack simulator game online is a real terrorist out to destroy the U.S . The system is called the War Operation Plan Response, or WOPR for short, developed by brilliant but now deceased scientist Stephen Falken (John Wood), who programmed the system to learn continually through game simulations . At the end , a message : The only winning move is not to play. This is an entertaining film of the 80s ; it was way ahead of its time and it stills grips the spectator . 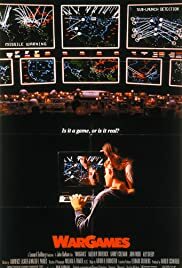 A popular flick in which a young computer whiz hooks into a game manufacturer's computer and accidentally starts WWII when he decides to play a selection titled ¨Global Thermonuclear Warfare¨ . The picture contains almost no violence , nor murders or any other sensationalistic content . Interesting as well as amusing screenplay by writers Lawrence Lasker and Walter F. Parkes who during their extensive research for the film, made friends with many 'hackers' and security experts. They later wrote ¨Sneakers¨ another film featuring 'hackers' and security experts. Likable starring couple , Matthew Broderick and Ally Sheedy , both of whom hold a great chemistry . Large support cast such as Barry Corbin , Dabney Coleman , Dennis Lipscomb and many of them uncredited as Michael Madsen , Eddie Deezen , James Tolkan , ArtLeFleur , William H. Macy , Maury Chaykin and John Spencer . Special mention to John Wood as Professor Stephen Falken ; main inspiration for this character was Cambridge Professor Stephen Hawking ; he was originally approached to appear in the movie, but he declined because he didn't want the producers exploiting his disability . Adequate musical score accompanying the action by Arthur B. Rubinstein and inventively photographed by classic cameraman William A Fraker . The film was part of a 1980s cycle of films about atomic bombs and nuclear warfare which had started in 1979 with ¨The China syndrome¨. The films included ¨Silkwood¨, ¨Testament¨, ¨Threads¨, ¨The day after¨ , ¨The Atomic Cafe¨, ¨Ground zero¨,¨Special Bulletin¨ , ¨Barefoot Gen¨, ¨Rules of Engagement¨, ¨Letters from a Dead Man¨ , ¨The chain reaction¨, among others . Followed by an inferior remake titled ¨ WarGames: The Dead Code (2008)¨ by Stuart Gillard with Matt Lanter as Will Farmer , Amanda Walsh as Annie D'Mateo , Colm Feore as Joshua and Chuck Shamata as Bill Carter . The motion picture was professionally directed by John Badham , though the original director was Martin Brest, and several of the scenes he shot are still in the movie , but he was fired as filmmaker a short while into production due to creative differences . Badham's breakthrough credit was the box office smash Fever Saturday night (1977) ; other hits on his resume include The Blue Thunder (1983), War games (1983), and Shortcircuit (1986). He's a nice director who achieved his greatest success in the 80s and 90s . He directed several hits (Drop zone , Nick of time , Skateout ,Point of No Return , Bird on a wire) , though today making TV movies (Jack Bull , Floating away) and television episodes (Crossing Jordan, Psych, Las Vegas, Standoff , Heroes).